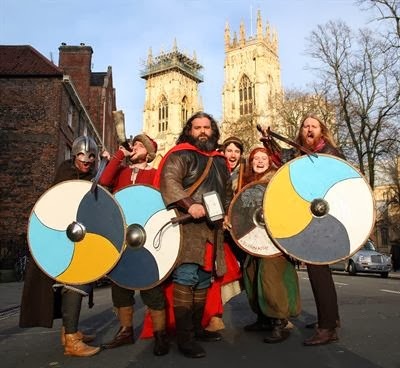 With little over a week to go until the world will find out if the prediction of Ragnarok, the Norse apocalypse, will come true on 22 February, Viking warriors have started to arrive in York for a week-long celebration of the city’s Scandinavian heritage at the 30th JorvikViking Festival. The first Vikings will set up camp – including a Viking longship kitted out for war - in Coppergate ready to welcome guests from 10am on Saturday 15 February, where visitors will hear ancient Norse myths and legends, meet the cunning woman who is preparing her cures for illness and injury and find out more about the oncoming storm! The camp will remain in place until the warriors are called to take part in the ultimate battle, on the evening of 22 February. A Saxon encampment, at the Eye of York, will also be in place throughout the first Festival weekend – and, no doubt, some skirmishes will break out when scouting parties from each camp meet! Throughout the week, Viking warriors will be offering advice and guidance on how to prepare for the ultimate battle, with have-a-go sword combat sessions for younger Vikings each day at the Merchant Adventurers’ Hall (£3 per child, booking is recommended), whilst long-established warriors will engage in combat with five days of action-packed sagas at York Guildhall (£3 for adults, £2 for concessions). A host of other events and activities, from animation workshops to author talks, archaeology lectures to candlelit storytelling take place during the week. One unusual highlight of the Festival will be Jorvik Alive! within the Jorvik Viking Centre itself on the evening of Tuesday 18 February. The attraction’s recreation of a Viking-age street on the very site where archaeological found well-preserved remains of Viking Coppergate is normally frozen in time in 975AD. However, for just two hours, from 6.30pm, the street will be illuminated by candlelight and populated by living Viking warriors and civilians, breaking the barriers of time for a truly interactive Viking experience! The culmination of the Festival takes place on Saturday 22 February, when the Vikings make their final preparations for the oncoming apocalypse! From a strongman competition to identify the likely leaders of the bold new world said to follow, to a fun ‘Best Beard’ competition, now entering its seventh year, the Norse warriors will be putting their affairs in order ahead of the journey to the battleground Vigrid. Around 300 Viking warriors will muster in Dean’s Park, adjacent to York Minster, for a march through the city streets in a fantastic show of strength from 1.30pm, and as the sun sets – perhaps for the very last time – at 6.45pm the troops will mass at the Eye of York for Ragnarok: Battle Spectacular Finale, which features thrilling live battle action, sound and light effects and pyrotechnics in the biggest and most spectacular finale in the last 30 years of Jorvik Viking Festivals. Full listings for the Jorvik Viking Festival’s events – many of which are free of charge – are available from the Festival website, www.jorvik-viking-festival.co.uk, including online booking for most paid-for events. Tickets can also be booked by calling the box office on 01904 615505. Tickets for some events, including the Strongman Competition, have already sold out, but some tickets remain for the Ragnarok Finale, priced at £12.00 for adults, £9.50 for concessions or £36 for a family of four.